Today I thought I would show you some of our rock work. Ironically, our mason's name was Rocky! He was born in Italy and had a very heavy accent. I never could thoroughly understand what he was saying to me which probably worked out for the best because he literally drove me crazy the entire 14-months period he worked here. We were sort of in a bind when I originally hired Rocky. Because we had changed the roof line our original chimney was now about 8' too short which means we had a huge hole in our roof and Winter was fast approaching. 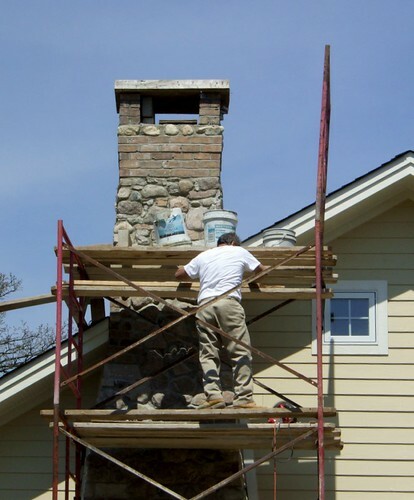 Rocky started right away on the chimney extension and finished it quite quickly which made me very happy. But then he would work for 4 days straight and then I would not see him again for a few weeks. And then out of the blue he'd show up again and work like crazy and then disappear. It was difficult because I could not seem to get him to work to any set schedule. 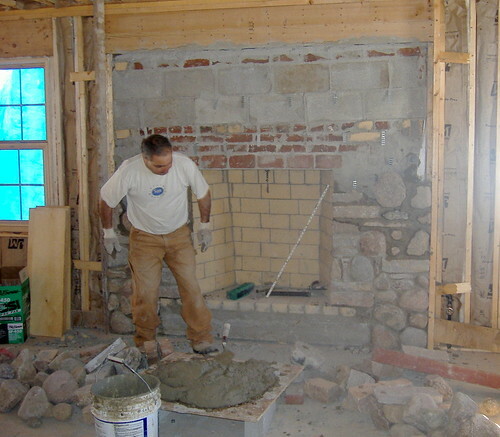 First we did the fireplace in our family room located in the new addition. I wanted it to look very old and in disrepair, with mixed rock and brick. But Masons like to do things straight and even so I had to keep a very close eye on Rocky and direct him to "take this out and put this in" and "make this crooked". Basically I had to check on him about every 15 minutes or so. But I do love the finished fireplace. See all this mess and dirt and crud! Don't forget we lived in this house during the entire process. In these pictures there is no drywall up yet and it was dead winter. We had moved into the basement but even with space heaters I still could not get the heat above 52 degrees. On the first floor temperature hovered around 43 degrees. 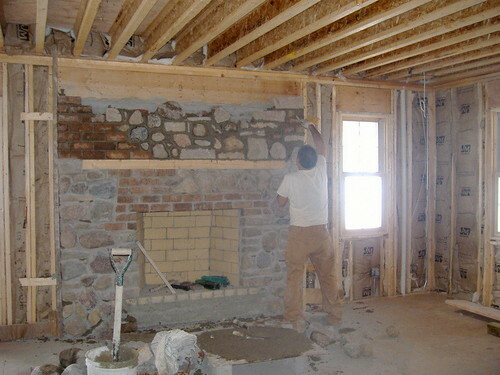 This picture was taken in May, 2007, drywall had been installed and some trim work is now around my windows. All that wood stacked up along the right side of the photo is more of my interior trim waiting for my finish carpenter Steve. 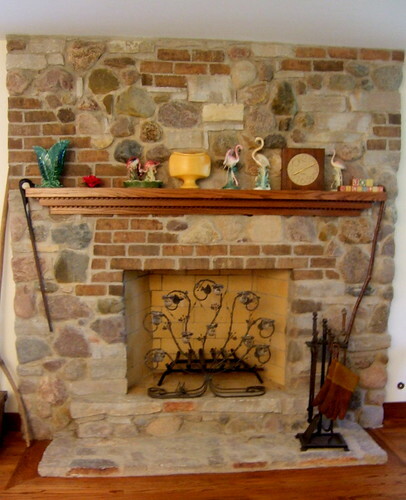 This is our original family room fireplace but due to the magic of remodel it is now located in our dining room. The original fire place facade was large white stone and it was huge. So we demolished the original facade and I could not believe how much better the room looked with that awful fireplace finally gone! 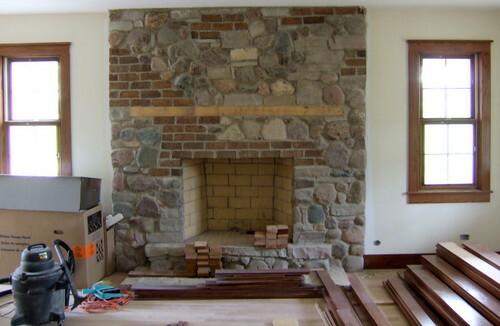 This was the second fireplace that Rocky worked on and at this point he had an understanding of what I liked and how I wanted the end result. So I pretty much let him do whatever he wanted. I LOVE this fireplace. 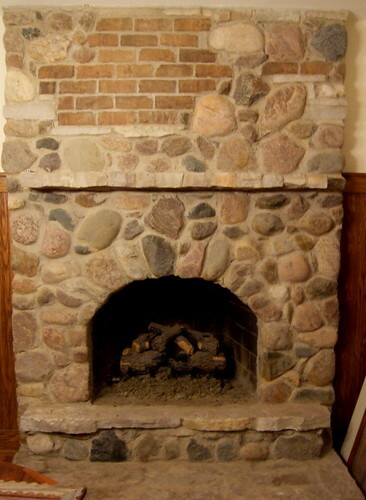 Although this is a wood burning fireplace, the room is not large enough for a real fire, so I had gas logs installed. The gas logs have worked out very well! It's just wonderful serving a holiday dinner in the glow of our fireplace. Love it! 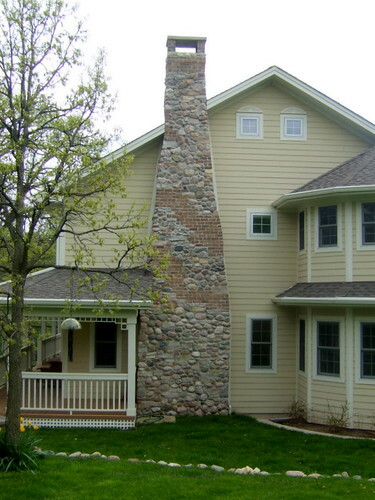 This is our big chimney that serves our family room fireplace. Again I wanted it to look old and weathered and crooked. This chimney and Rocky really tested me. At first Rocky put about 3' of plain brick at the base. Ah NO...that's not what I want. Rocky told me to "just plant bushes to cover it up". I know that most of my readers really don't know me. But NO ONE tells me to work around their mistake when I'm paying them to do a job. 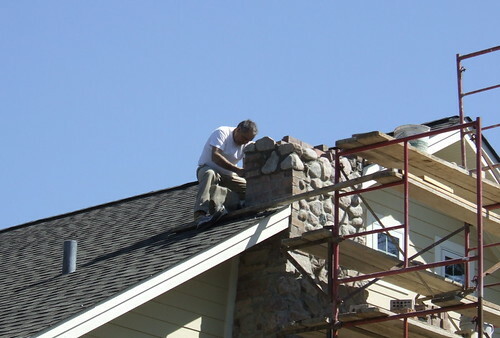 Needless to say Rocky tore out the brick and built the chimney exactly how I wanted it and never again gave me any problems at least with the chimney. I love my chimney. I think it makes the entire house. The finished chimney made me very happy. This is how our chimney looks today. WOW..no more mud and the porch is finished too. There's even some landscaping done! 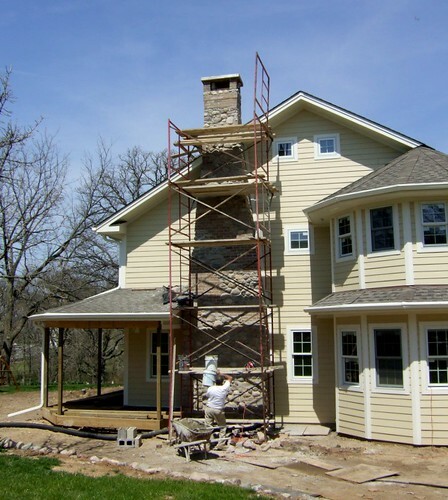 When ever I look back at the my construction photos I am amazed, not only that we lived through the entire process, but the amount of work that was completed is unbelievable. WOW! Metamorphosis Monday is hosted by Susan of Between Naps on the Porch. Please visit Susan's site and you'll find some fabulous ideas freely shared by many gracious and highly creative people. Rocky made it ROCK Michelle...amazing...WOW!! That has to be the prettiest brick and rock work! I love the blending of the two materials both inside and out. Wonderful job! That looks like a lot of work! Rocky did a great job! Just love it. We lived in an undone house in Florida. One day I came home from work and the front of the house was gone! Even though I knew this was happening at some point, it was a shocker to see my furniture practically on the street, like a dollhouse. Great job you did. You have such great style! If I ever have means and opportunity to do over a big house - I am definitely putting you in charge! That's a funny story about having to direct him to make it "not be so even." :-) It turned out great. Congratulations! 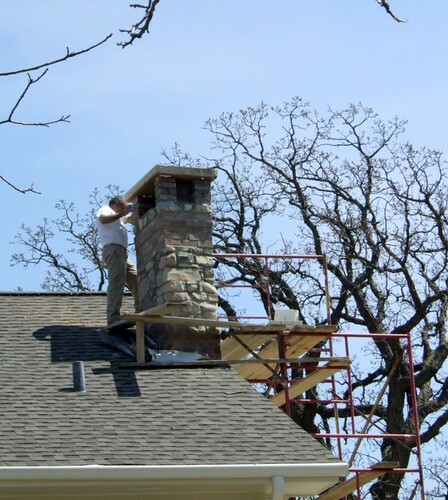 Your fireplace and chimney are amazing! Rocky is Amazing! 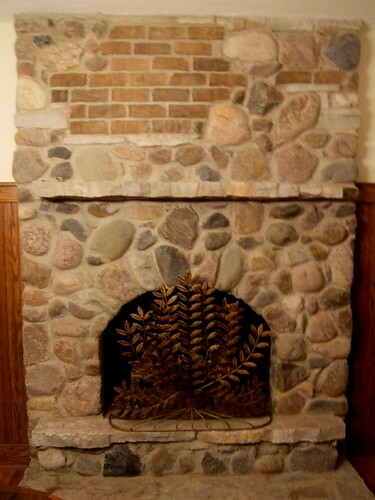 This sort of rock work always makes me think "cottage"~ ~Love it! Wow - - - what an interesting mix of rock and brick. I bet you are glad you are finally finished.. Very cool that the chimney matches the fireplace....you really know how to coordinate ! Love it ! Welcome to the world of hiring subcontractors. 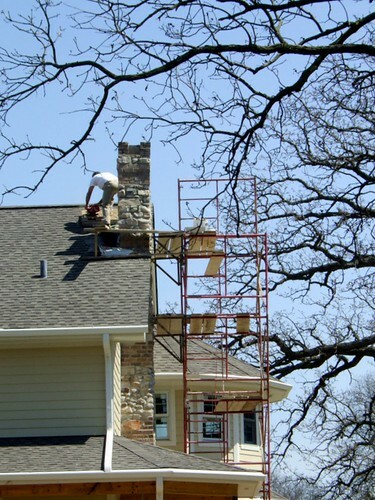 As a home builder and remodeler, this is what I deal with all the time. I will say that I pretty much have now nailed down subs that will show up on time and that I can find when I need to, but I've been right there where you were with Rocky. Love your finished product. Great combination of brick and stone. That chimney looks as if it belongs in an old story book--Rocky got it right!!!! Your patience, vision, and tolerance of cold temperatures :) have certainly paid off!!! You are the most creative mind I know...how you ever envisioned this, planned it, and executed it is way beyond anything I can imagine. It looks so perfect!